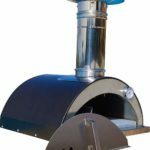 Although it is the smallest and lightest model in the range, this Forno Allegro pizza oven is still mighty at preparing perfect pizzas. It has a 40 x 50 cm floor space on which you can cook not just pizzas, but all of your favourite dishes. The smaller size makes it easier to control the temperature and fire/fuel, for a more consistent cook. As it has a stainless steel build, it is easy to keep looking new and clean. Clay models tend to crack and wear away due to the high temperatures, but you won’t face this problem with the more modern material and design. This gives it some protection from the elements so that you can keep it outside ready for outdoor cooking all year round. It also contributes to the fact it is relatively lightweight. At 35kg, it is easy to lift and move around your garden from surface to surface, as long as they are heat-proof. It can also be taken on camping holidays and to friend’s houses. 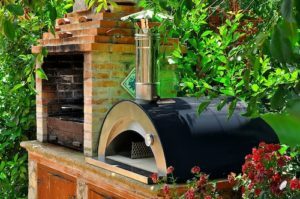 Despite its manoeuvrability, the solid oven base is cut from natural volcanic lava rock from Mount Etna, so the oven heats up incredibly fast but retains this heat for longer than other materials, meaning more fuel efficiency. The temperature is also consistent across the whole base so foods which have full contact with it, such as pizzas and bread, will receive even heat distribution. This is very important for both the quality and taste of the end product. There is a handy temperature gauge built into the top of the oven, so there is no guesswork needed, and you will know if your food is cooked thoroughly. It can easily reach 450°C with little fuel thanks to the full insulation. The only significant downside is that it is on the small side; while this makes it better at controlling heat, there isn’t much room for cooking things other than pizza. Getting wood into the unit can also be fiddly, but once it gets going the performance is powerful.